I am currently trying to cash out of all but two sites and so far only PokerStars has settled with me. I am waiting for Bodog, DoylesRoom and TruePoker to “show me the money!”. I cannot request funds from Poker Host and Carbon Poker because I am below the minimums that they allow for withdrawals. So either I deposit more money so that I can withdraw it (that is not going to happen). Or I need to win enough or lose enough to resolve those issues. I am trying the latter, winning. As far as UB (formerly known as Ultimate Bet) is concerned, I am probably going to lose my funds there. Maybe even FullTiltPpker will not be able to payoff their US players, although it seems like they are trying to settle up. I am currently playing on only two sites, LuvinPoker.com and BlackChipPoker.com. LuvinPoker.com is the site chosen by Railbirds.com, a group of which I am a member. BlackChipPoker.com has a deal with Dusty Schmidt and I got a good bonus and three free poker books to add to my 60 plus collection already. See Dusty’s blog for more details. I really love poker and need an online poker outlet. My local poker room has only limit games and I cannot seem to beat those yet. So I have two sites left and hope that I can continue to play there, withdrawing my earnings as I go along. Hopefully. Oh yes, I am still playing on FullTiltPoker.com. I am playing Omaha 8 on the Rush Poker Tables. 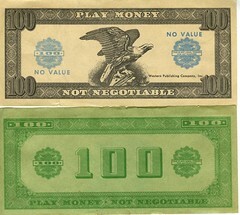 I am only using play money and have built my play money bankroll to 100,000 from the 1,000 that they started me with. I will probably continue to play at FTP as it works on the Droid phone and I can play in the middle of the night. How are your post “black friday” plans working out for you? Have you had any luck cashing out? What are your next steps?